The book follows football journalist Paul Watson and his best friend Matthew Conrad as they decide to find the world’s worst national team and the original plan was to play for them after becoming naturalised citizens. This plan changed slightly when they realised how long this could take and instead they decide to coach the world’s worst natural team. This search leads them to Pohnpei, a small island near Guam and part of Micronesia. They give up their day jobs and trek halfway around the world to arrive and find a team used to kick-abouts, playing on a poor pitch which is home to many toads and frequent downpours. Pohnpei’s previous international fixture was a mere 16-1 defeat some years previously. The players are all characters, from a Huth like defender through to Dishlan, the most talented footballer they find on their arrival. He is a key player as he will take the team on from when Paul and Matt have achieved their aim. Paul Watson has an easy writing style, written very much as a fan of football and his enthusiasm really comes through in the book, be it when the team play the first of three fixtures in Guam or his pride at getting things taken for granted in the UK like kit and footballs (kindly donated by Yeovil Town, kudos to them). 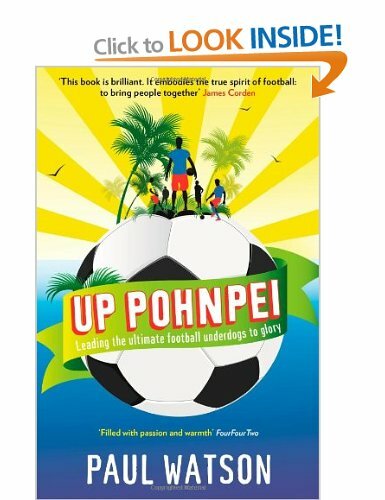 The book shows that at its grassroots football is a real community sport with the local families helping the players and Paul and his pal Matt over the various problems they face in getting the team trained and prepared for their games in Guam. It is a very funny book at times and you can tell he writes about football for a living as his match reports are brisk, yet sum the games up nicely. Of course in any sport there is politics even in a small island like Pohnpei, where other sports like baseball and basketball vie for the all important funding from the IOC. FIFA prove a hard nut to crack and for a developing footballing nation like Pohnpei funding is so vital. Even if you’re no big fan of the beautiful game this book is a heartwarming tale and shows that football should never loose sight of it’s most vital resource, the people be they players, fans or two daft Englishmen giving it all up for eighteen months to coach and develop a national squad. Did they win a game? Read the book! This entry was posted on June 20, 2013 at 9:16 pm and is filed under Authors, Books, Football with tags book review, Paul Watson, Pohnpei, Yeovil Town. You can follow any responses to this entry through the RSS 2.0 feed. You can leave a response, or trackback from your own site.